BUFFALO, N.Y. -- Head men's basketball coach Nate Oats has announced the addition of transfers Antwain Johnsonand Gabe Grant, who have both signed their scholarship agreements to join the Bulls. Both players will sit out the 2018-19 season due to NCAA transfer rules and will have one year of eligibility for 2019-20. "The addition of Antwain and Gabe is huge for the future of this program," said Oats. 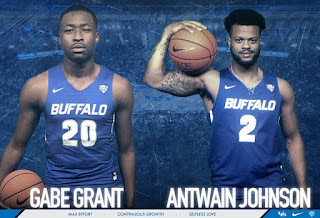 "After they sit this year, and they are eligible for the following year, that will give us three seniors along with Davonta Jordan and that will put us in a great position to continue the success we have had as a program over the past five years." "These two will help us every day in practice this year, bringing a wealth of experience from winning Division I programs and both players were very well coached at their previous institutions," Oats added. Johnson, a 6-2 shooting guard, played the last two seasons at Middle Tennessee State for head coach Kermit Davis, who is now leading the program at Ole Miss. Johnson averaged 10.3 points per game last year, while shooting 44.2% from the field and 39% from three-point range. He scored in double figures 16 times last year, including a career-high 24 points at Charlotte, part of a stretch where he scored in double figures in eight straight games. Johnson started the final 15 games of the season, increasing his scoring average by nearly six points per game from his sophomore to junior season.